Stunning elf shaped ear wrap is accented with a crystal drop. Choose right or left ear. Absolutely stunning! 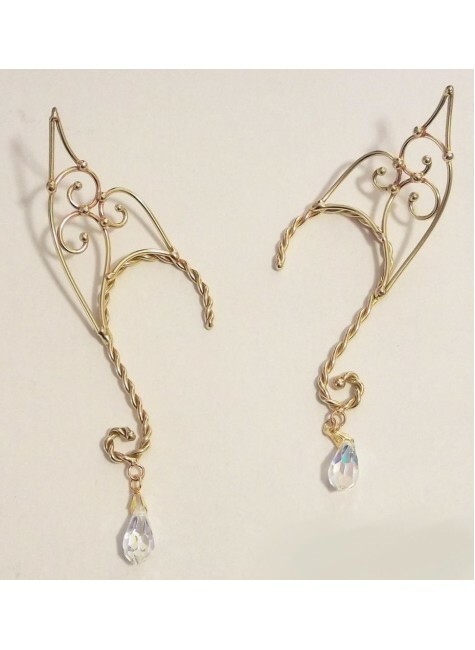 This filigree elf ear wrap is hand made of bronze with a sparkling crystal drop. Created by a true artist, these ear wires wrap around the back of the ear so the the wing-shaped ear tip rises from behind the ear. Non-piercing, the bronze is strong enough to hold its shape and malleable enough to adjust to your ear. Item Number: BZ-EARSELF | Approximate Size (Inches): 2.00 wide x 0.25 deep x 5.00 high | Approximate Shipping Weight: 0.50 lbs.